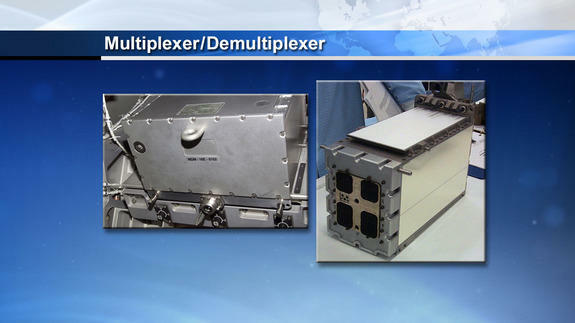 At 2:31 p.m. EDT (18:31 GMT) on Saturday, May 20, 2017, a data relay box, called a multiplexer-demultiplexer (MDM), failed. The unit, which primarily controls the functionality of the outposts massive solar arrays, radiators, and provides power to other components, is one of two fully redundant boxes on the S0 truss segment. When ground teams began troubleshooting the problem, it soon became clear that it would need to be replaced via a contingency spacewalk, which managers scheduled for the morning of May 23. 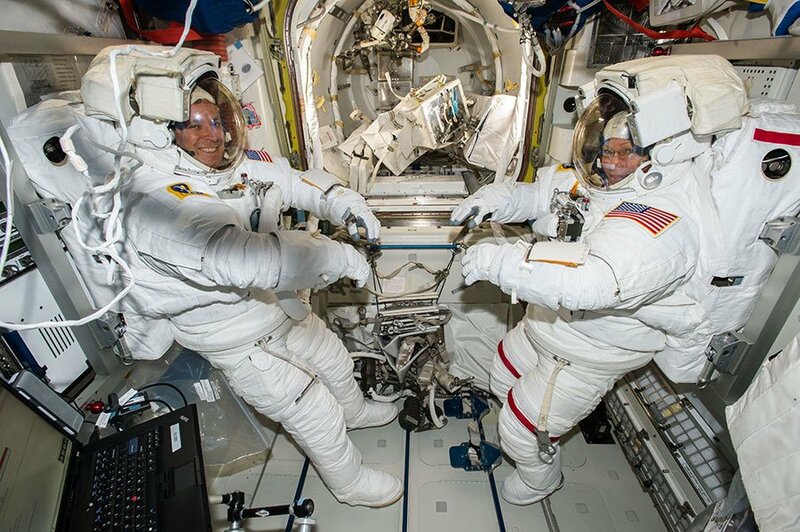 That morning, two Expedition 51 crew members suited up and entered the airlock with the help of fellow crew member and European Space Agency astronaut Thomas Pesquet. Whitson wore the suit with red stripes and was designated EV-1 while Fischer wore the suit with no stripes and was designated EV-2. U.S. Extravehicular Activity (EVA) 43 officially began at 7:20 a.m. EDT (11:20 GMT) after the Quest airlock was fully depressurized and the two astronauts’ suits placed on battery mode. After checking to ensure everything was working properly on their suits, the two went separate ways. Whitson traveled up to the S0 truss segment where the failed MDM was while Fischer went to the Destiny laboratory to install two antennas. The antennas were originally scheduled to be part of the previous EVA, but, because it was cut short, that task was taken out. These antennas will be used to route wireless data from various external equipment and high-definition cameras. Once Whitson made her way to the work site, she started unbolting the failed relay box. Once done, she visually inspected and reported clean connectors, indicating there was likely no electrical arcing to cause a short. Engineers on the ground are unsure what exactly caused the box to fail. While removing the box went smoothly, attaching the spare in its place required more work. When Whitson used her Pistol Grip Tool (PGT) – a space-grade power drill – to tighten the center bolt, she noticed the box didn’t appear to set properly. Additionally, the PGT was showing a low torque reading. Just to be safe, she unbolted it and inspected the bolt connectors. That’s when she noticed pieces of what looked like metal shavings coming out of the box. Engineers on the ground felt that might have been grease and did not indicate stripped grooves. To be sure, it would need to be cleaned. Additionally, her PGT was showing a problem and would need to be swapped out. Meanwhile, Fischer was making steady progress on the installation of two antennas. He had finished his task by the time his assistance was required. Since he no longer needed the PGT he was using, he translated over to Whitson’s work site and swapped his drill for hers to take back to the airlock. Additionally, he grabbed the cleaning tools, also in the airlock. Once he was back at Whitson’s side with the tools, Fischer helped her clean the connectors. After that was done, Fischer went back to his work site to finish routing power cables to the antennas. After re-bolting it in place, and giving it a few more turns, the stubborn MDM was finally in place and an Ethernet cable installed. Engineers on the ground quickly verified the box was healthy and Whitson could begin cleaning up her area to return to the airlock. Not long after that, Fischer also finished his task before also heading to the airlock. Once both were inside Quest, Fischer closed the hatch and re-pressurization began, officially ending EVA-43 at 10:06 a.m. EDT (14:06 GMT) for a total of 2 hours, 46 minutes of spacewalk time. This was Fischer’s second spacewalk; his first occurring less than two weeks ago. His total EVA time is now at 6 hours, 59 minutes. Whitson, on the other hand, was on her 10th spacewalk, tying the record for the most of any American astronaut. Her cumulative EVA time now stands at 60 hours, 21 minutes: third place behind retired NASA astronaut Michael Lopez-Alegria’s 67 hours, 40 minutes over 10 spacewalks. Should Whitson perform another spacewalk, she would only need 7 hours, 20 minutes to cross Lopez-Alegria’s cumulative time. 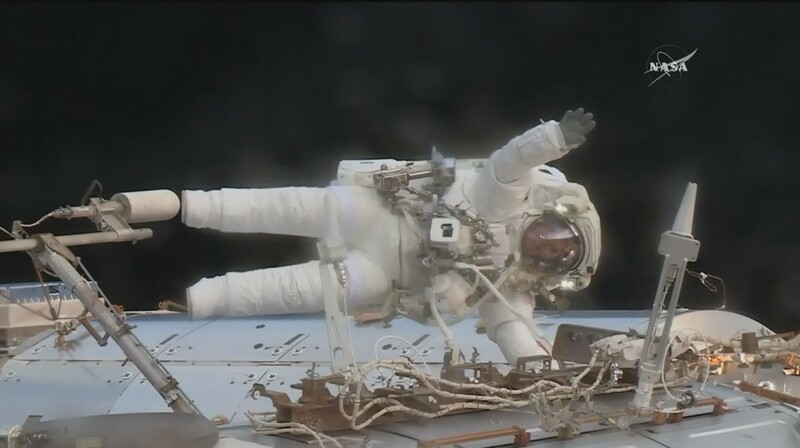 Retired Russian cosmonaut Anatoly Solovyev continues to hold the record of most cumulative EVA time with 82 hours, 22 minutes over 16 spacewalks.